There's nothing quite like the sensation of looking at a fully stocked wall or shelf of games and remembering the experiences had with each one. However, most gamers that have been playing games for several years will likely have amassed quite a pile over time, but who doesn't appreciate a chance to show off their collection? A new startup called "Linked to the Wall" aims to cater to those who wish to show off their collection and plans to do so in an interesting way. 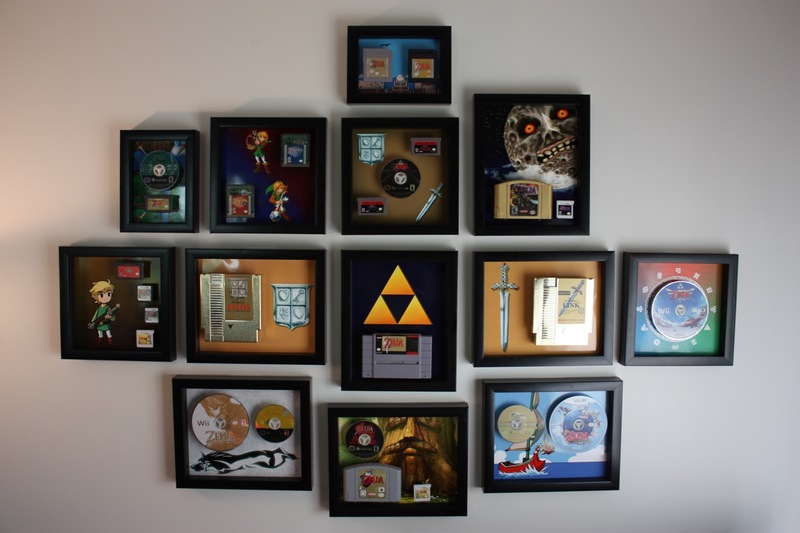 It all started a few months ago when the creators posted a picture to Imgur of a wall decoration that mounted all entries in the Zelda series in a massive collage. Evidently, positive response to the image was so strong that they saw a potential opportunity to expand the idea into a service. "Mark" and "Bill" just recently launched a Kickstarter for the concept, offering gamers the opportunity to help raise the funds for these special mounts to be mass produced. You can check it out here; the campaign still has quite a ways to go, but there's certainly a chance of it seeing completion. What do you think? Will you be contributing to this? How do you prefer to display your games? Drop us a comment in the section below. Looks really nice, but makes me bummed thinking of all those classic carts not getting played. This isn't for me. I like to play my games. Might be cool for something that's particularly rare, but not SMB/Duck Hunt. And those loose discs just look lonely. I'd be upset if people were driving nails through carts to accomplish this, but as long as the carts are unaltered, people can do whatever they want, I suppose. @JohnBlackstar The games are just put on display, they even state: "When it’s time to replay your favorite game, or if you want to put new games on display, you can easily remove them from our mount." I'd say you're actually inclined to play the games if they are displayed like this. I like this concept. Since you can still play them that's pretty sweet. This is better than some people literally wanting hundreds of copies of a single game. At least these are still easily accessed for play. Actually looks very cheap that more or less anybody could make themselves if they wanted to. "That cartridge is blocking my art..."
I had this idea for that terrible atari ET game, just because it was a terrible game but in a fancy frame lol. That's very cool, but I hope there's some way you can easily take the games out and still play then, should you want to do so. Edit: Well, you can take them down and use them whenever, so that's excellent. (Here's another example image, which I particularly liked on the Kickstarter page. understand it. but I own original nes, snes and n64 wooden cabinets for storing my games. I rather be able to pull out and play and save more money for games. @Konda I'm one of the project creators, I'm with you here, when we started the original project, we looked at is as a really "cheap" way to dress up our offices and bring out our games. As we assumed It can be relatively inexpensive to do this yourself, you are correct, especially if you don't mind putting adhesive on the cartridges. But we realized quickly that things get complicated when you want to make sure you don't damage the cartridge in any way by putting adhesive or tight fitting clips on it and its even more complicated if you want to be able to constantly remove it and replace it so you can play it or swap them out. You also want to make sure light doesn't damage the cartridges so with respect to the display kits, buying single sheets of UV resistant acrylic in single quantities can get expensive but getting them in bulk is much more reasonable. Also working with acrylic can be painful if you haven't done it before so drilling and mounting might be a challenge for some. For the record, when we started the original project, just for ourselves, we didn't realize how expensive it would end up being either. We tried to price the Kickstarter near what it cost us to do a single unit by getting things in bulk. Thank you for your input, we appreciate it and hopefully it will help us make our message more clear. @Kirk I'm one of the project creators and I wanted to thank you for your support. @byllc Ok - you guys are amazing. @readyletsgo I have a mount for my ET game as well but we didn't design any for the Kickstarter. The problem with the Atari 2600 cartridges is that some of them have the labels on so that they insert upside down. This doesn't leave us anywhere on the bottom to 'grab' the cartridge. But this is definitely something I'd like to do, I have a ton of 2600 and 800XL games. @dronesplitter We feel your pain. I have a bunch of SMB level images mounted on their own in shadowboxes now because of this. I couldn't give any meaningful money because I'm genuinely skint, but every penny helps and the support alone probably feels nice. @RamrodDestroyer Thank you for appreciating the project. As far as being expensive we tried to make the display kits something that could be considered "Museum Quality" and that meant using high end UV rated acrylic and solid mounting hardware, we also have the backing board being provided with a self stick coating so you don't have to use glue or tape to attach your images. When all is said and done, we priced the display kits around what it would cost to buy and make a single display kit yourself without a bulk discount. There is also a bit of processing involved, drilling holes etc.. which is actually not as trivial as it seems, acrylic can be tough to work with. With respect to the mounts themselves, anyone one with a 3D printer can make them cheaply and We will be releasing the STL files in the future as well as resources to find the art we used http://vgart.github.io/ so we definitely encourage others to do this on their own. If only I had prepared my life better I would have made a home with a gigantic gaming room and never would have had to basically stop getting physical media games. The walls, the walls would be my storage! Nice idea, although not for me. Sadly, I don't have any of my old games anymore. But if I had, I would probably use those kits only for games that I'd stil like to play. @TossedLlama @CynicalButter: You do realize that they are designed so that you can remove the cartridges any time? @Konda: I disagree about the cheapness part, but I totally agree that they look like you could build them yourself (and @byllc basically confirmed that). @byllc I just wanted to say that it's really great that you guys will ipload the STL files later, so that other people can make their own kits. I was actually thinking about suggesting a DIY tutorial. Might as well hang up a giant neon sign above them saying "Here, steal this!" Sorry if I sound bitter. Someone broke in to my apartment and stole a lot of my games/consoles over the holidays. Nice idea, but the price of the wall mounts is laughably high. $30 for a whole kit is not great, but it is acceptable--at least, it would be if it included the background art, but it appears that it doesn't. @Dr_Corndog, We appreciate your input and thanks for liking the idea. As far as the price is concerned If we could make them cheaper, we would... small run manufacturing is still expensive. When all is said and done If we get backed at the minimum level after time spent fulfilling orders we will not have much (if any) profits. But what we will have is injection molds to make more mounts more cheaply. Injection molds are a great deal of the cost built in as they are several thousand dollars a piece. Sure, once you have the molds, the units are really cheap to produce if you can continue to buy them in high enough volume but you need a good demand make it happen. As far as the display kits are concerned I don't know if you have ever shopped for quality framing and mounting for collectibles but we are actually priced on the low end for what we are providing. You can certainly buy cheaper acrylic but we wanted high quality acrylic with a solid UV filter rating to protect the games from fading, good mounting hardware, and a quality backing board with an adhesive applied for attaching the art. Since we can't expect more than a small run of these, we had to price them accordingly, based on expected demand. This is a cool idea but I don't have the space for it, alas. I see the project creators posting in here so good luck, guys. @byllc I'm mostly an all digital man, but I certainly hope this makes it into production! It's one of those things you don't realize you want until you've seen it. Game hoarder here, so I love this!! @RobNYC1977 Thank you I'm a bit of a hoarder myself. @MitchVogel I was mostly all digital for a long time. I just started resurrecting some old retro classics. I even dug out a ton of Atari 800XL cartridges, tapes and floppies to play. There is something about the feel of the original system, at the exact speed it was meant to be played on a controller so sturdy you could play football with and it will still survive. I can't even afford to get N64 cases with art for my small collection of N64 carts, but I am in love with this concept. I'll probably just have to jerry-rig my own setup using shadow boxes and lots of markers. Then I just need to learn how to draw. I hate my printer. @AshFoxX you can get background art at vgmaps.com and cover art at The Cover Project. Also, if you have any access to a 3D printer, we'll be releasing the STL files at some point after the Kickstarter. While we like our display kits quite a bit, you can buy shadow boxes similar to the ones we used for the Zelda wall at most hobby and craft stores. We'll happily anyone do this themselves whether they support the Kickstarter or not.